Yeah, Morgan and I like to read. There is a used bookstore in Jacksonville, and I highly recommend it if you’re in the area: Chamblin Book Mine. 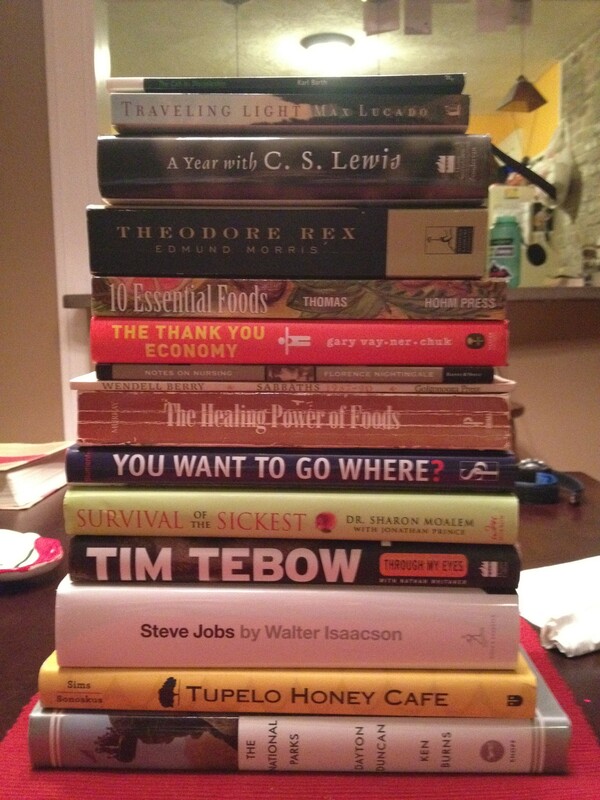 We went a little crazy there, and then were given several books for Christmas. This is before we swap gifts with Dan & Karen, who usually give at least 1 book. The National Parks: America’s Best Idea – To Morgan from Me – Morgan and I love going to National Parks, so far the list includes: Great Smoky Mountains, Grand Canyon, Zion, Yosemite, and Rocky Mountain. Next year we hope to hit a few more, including Yellowstone and Glacier. So this beautiful book was a no-brainer. Tupelo Honey Cafe Cookbook – To Me from Morgan – I really enjoy cooking, I enjoy planning meals and executing them. I love all 3 meals, in the order of: Breakfast, Dinner, Lunch. Tupelo Honey Cafe is one of the best restaurants here in food-crazy Asheville, if you ever have the chance I highly recommend going. The cookbook is very well done, and what gives it an extra kick is the research given to the history of Asheville, different dishes, and photography. Steve Jobs – To Me from Mom & Dad – My parents brought me up on a love of reading, so they are always happy to give me books as gifts. My Dad and I share a love of Apple products and business books in general, so this book was an easy buy. Very much looking forward to diving in. Tim Tebow: Through My Eyes – To Me from Morgan’s family – Being a Gator grad, Tebow fan, former homeschooler, Christian, and Jacksonville native, Tim and I share some similarities (and I just listed them all). Our parents actually know each other, so a lot of his past I’m already familiar with. But it will be a good read regardless. Survival of the Sickest – Morgan bought for herself – She is studying to become a Nurse, and is also very interested in nutrition. You Want To Go Where? – From Me to Morgan (but really for both of us) – We’re always talking about traveling and big trips, and the thought of being sponsored and paid for is certainly intriguing. Sabbaths, 1987-1990 – I bought for myself – Wendell Berry is one of my favorite authors, really enjoy the way he writes. You need to set aside at least an hour when reading his novels, because there is a rhythm to them. This is a book of poetry, and semi-rare it turns out, since I can’t find a decent link to it. The Thank You Economy – To Me from Mom & Dad – A highly recommended business book, and good for the business I’m in (camping, male development, and relationships). I look forward to it. Theodore Rex – I bought for myself – I have a interest in the life of Teddy Roosevelt, such an adventurous spirit and one of the greats of modern manliness. Should be a great read. A Year with C.S. Lewis – From Morgan to Me – With all respect to Wendell Berry, C.S. Lewis is without a doubt my favorite author and the one whom I have read the most books. Narnia, The Ransom Trilogy, Mere Christianity, The Great Divorce, Screwtape Letters, and on and on. To have a brief bit of his wisdom and wit in each day will be wonderful. Traveling Light – From Me to Morgan – Max Lucado is one of Morgan’s favorite Christian authors, so I knew she would enjoy it. A Call to Discipleship – I bought for myself – Earlier this fall I read the Dietrich Bonfoeffer biography (it was fantastic) and noted that one of his mentors was a theologian named Karl Barth. Barth was extremely influential and well-regarded as a theological mind, and helped shape modern theology. After my good friend Bert said Barth was next up on his reading list, I figured I would pick up this slim volume for my own collection. So there you are, looks like we have a lot of reading to do this New Year! Did you receive any books for Christmas, or have a couple on your list? This entry was posted in Book Reviews, Links Worth Clicking, Personal and tagged asheville, books, Christmas, cs lewis, food, national parks, reading, steve jobs, tebow, teddy roosevelt by mattragland. Bookmark the permalink. I love when people recommend food books because I never read them and I’m trying to eat more healthy. So, thank you. Thanks Cassie! I will see what else we can get together for recommendations. I would also recommend The Harvest Eating Cookbook by Keith Snow. It’s very healthy and delicious, plus he organizes recipes by what’s in season. Also included is a “Well Stocked Pantry” list that I have found very helpful. Good luck! The seasonal one is probably perfect because I get kind of looney over pumpkin in the fall. Yay! !